I hope 2015 is rocking for you like it is for me! This past weekend I had the privilege to speak to the NOLA Stars, a North Louisianan Chapter of Romance Writers of America. They were a marvelous crowd. I'm excited to participate in their conference in March. If you're looking for a good place to start your adventure into publishing, I encourage you to attend! Two years ago this convention set my feet on a new path. It's worth it! Learn more HERE! Once again I will travel down to Katy, TX on February 28th, for the HAB! I had such fun last year! Come meet authors of every genre and load up on books for 2015! More information to come. Break Her Fall Party and Blog Tour! Release Day Party on Facebook! 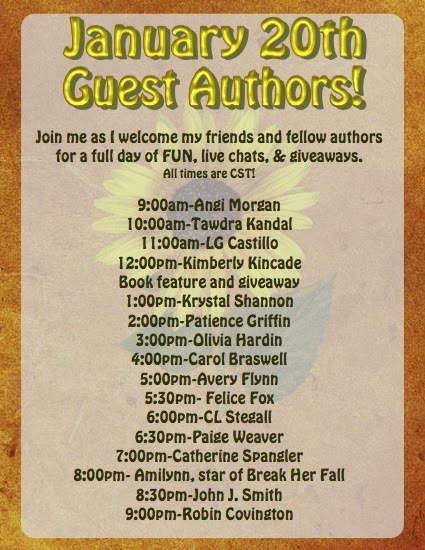 To celebrate the January 20th release of the Blake Pride Series book 2, BREAK HER FALL, I'm hosting an online party with a few of my awesome author friends. Join the party on Facebook for author chats, freebies, and fun! The tour starts Jan 26th! Hope to see you at one of the following stops!